Repairs from Mechanical Temp LLC. - contact us today to provide effective repairs and preventative maintenance! Michigan summers can be sweltering; don’t let your building fall victim to scorching temperatures. When the temperature outside skyrockets, as a building owner, it’s priority one for your building to have an efficient cooling system. 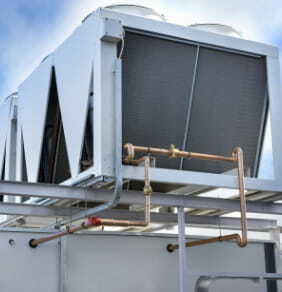 The HVAC/R experts at Mechanical Temp know how frustrating a broken cooling system can be, which is why we specialize in the repair, maintenance, and installation of the area’s commercial cooling systems. 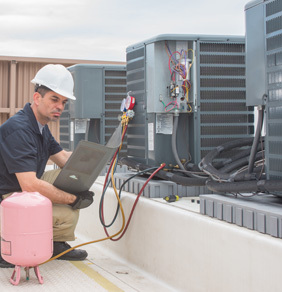 Our rooftop AC service and repair team knows that a commercial building or industrial plant can heat up quickly when your AC fails, so we offer emergency service and quick response times, allowing us to be there for your business when you need us the most. We pride ourselves on providing expert HVAC/R support to our clients, as well as continuously furthering our education to ensure we’re the most qualified company to handle your cooling needs. Mechanical Temp's repairs are quick, efficient, and set your commercial cooling system up for success. When you contact us for commercial AC service and repair, we don’t just put a temporary “Band-Aid” over the problem; we get to the bottom of the issue and fix it! We believe in honest workmanship and are passionate about our customers’ businesses, meaning that we’ll never cut corners. We’re available 24/7 for emergency HVAC service, as we know that necessary cooling system repairs are needed when you least expect them. Our expert maintenance plan improves your cooling system’s efficiency and prevents future costly repairs. Along with rooftop AC service and repair, we also provide annual maintenance checks to keep your cooling system working optimally. These maintenance checks are critical, as they allow us to detect small problems before they turn into larger ones. We use the latest in diagnostic technology, which prevents you from spending hundreds or even thousands on your cooling system in the future! A poorly-installed cooling system can result in high energy bills and further problems down the road. At Mechanical Temp, you can rely on our experienced technicians to replace or install the ideal cooling system for your business. We are an Authorized Bryant Dealer, giving you endless options for an effective cooling system. Our installations are quick yet accurate, minimizing your business’s downtime but not sacrificing on quality workmanship. It’s time to request a new HVAC/R solution. Contact Mechanical Temp today for cooling system repairs, maintenance, and installations!